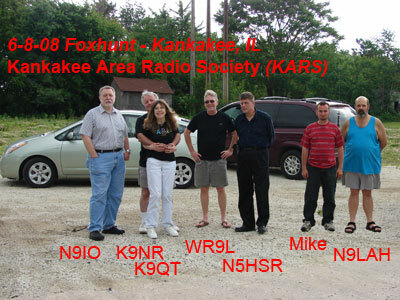 On a 90° day in Illinois the N9IO Prius "Fox Mobile" has proven to be the vehicle of choice for the hunt. Sitting for an extended period of time with the A/C on has overheated many a foxmobile. over the years waiting for my foxhunting friends to find my location. Barely used any fuel at all, I mean almost nothing. Em-Comm vehicle, weather spotter, etc. in the cleared lot right off I-57 at the Chebanse Illinois Exit. Crystal, W9IOU says the fox's signal was all over the place, lots of reflections. bunch gathering, N9LAH, Phil and Mike, nephew to KARS own N9OE.